Now, with “Jennifer Government ” — Barry’s new novel set in the not-too-distant-future and due to be released next Tuesday — the Australian-born author and survivor of corporate trenches proves that marketing, indeed, is the virtual key to success. Prior to publication, rights were sold to Section Eight Films, a production company owned by actor George Clooney and director Steven Soderbergh, whose credits include Traffic and Erin Brockovich. Writer Scott Burns – who recently adapted Soderbergh’s The Informant: A True Story – has been hired to write the screenplay. Burns’ credits also include the “Got Milk?” campaign. If all that weren’t enough, the free web-based game “Jennifer Government: NationStates,” has generated some 40,000 new “nations” in the past two months. Those possibilities stretch readers’ imaginations with a hilarious vision of the future that, while written as a satire, is disturbingly on target. It is a world run by American corporations, where taxes are illegal and employees take on last names of the companies for which they work. The Police and the NRA are publicly traded security firms, and the U.S. government investigates only those crimes in which individuals can be billed. The story revolves around Hack Nike, a merchandising officer who takes on a special assignment without reading the contract’s fine print. His new assignment: gunning down teenagers to promote a tough urban image for Nike’s new line of shoes. 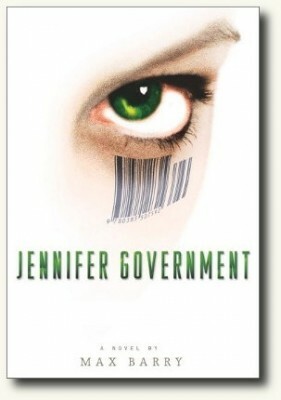 Can Jennifer Government expose the conspiracy? Further complicating the plot are two Nike executives, John Nike and John Nike (the boss of the other Nike), Buy Mitsui (a stockbroker with a death wish) and Billy NRA. The NRA? Nike? Mitsui? Is Barry concerned about one possible big consequence – that someone might try to sue? What Barry finds hard to do is write a book – or develop a website – without injecting lots of humor (and plenty of parenthical asides). He used his marketing finesse and that theme of consequence to create his own detailed website complete with a political nation simulation game. Barry also felt it would be a good way to help promote his upcoming novel. The game has a humorous bent, yet players develop a sense of how policies evolve. They choose a name for their nation, a motto, a national animal and a currency. Following that is a short questionnaire that determines what sort of nation – from authoritarian to permissive – that they have created. Once a day they are faced with an issue and need to make decisions. Since the game premiered in November, over 40,000 virtual nations have been created. Barry’s entertaining website also involves readers in a number of other fun projects. He offers serio-comic tips for writers and approaching a publisher (bump into a senior editor at a cocktail party, get drunk together and take incriminating photos), he let readers vote on their favorite book cover, and also provides regular updates on the status of the film. At this stage, it’s unlikely that Soderbergh will direct the film himself, Barry tells his website fans, while adding another parenthical aside (Apparently winning an Academy Award fills your schedule right up). With such keen marketing know-how, why does Barry write?